Goodridge brand new G-Max hose is another first for Goodridge and our industry. Constructed with 100% PTFE single core and polyester braid G-Max hose is 40% lighter than rubber core hose. Combined with up to 10% larger ID, and 20% more flow potential than rubber hose G-Max is the choice for you when the ultimate performance is demanded from a limited budget. G-Max is compatible with all fuels, including methanol, alcohol and E-85 with no vapour loss, and can be used with our newly developed 711 crimp style fittings and our exclusive patented 811 reusable fittings. 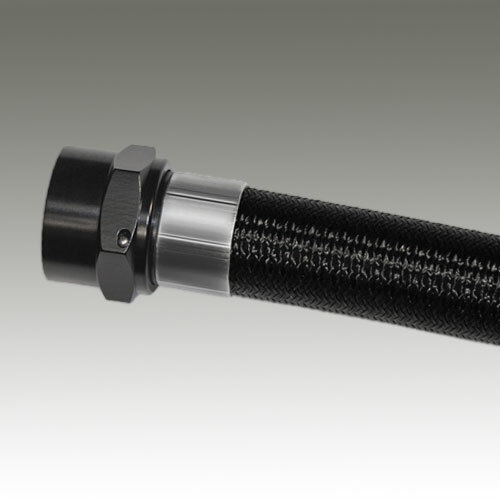 Factory assembled or self-assembled, G-Max hose is set to revolutionise the motorsport world. G-Max hose is for use in non-vacuum applications. Material/Construction: Anti-Static, PTFE smoothbore, polyester fibre braid.